Beginning last November, I documented the growth of a pineapple in my garden over a period of several months, from the time it was a very small fruit until it was ready to pick. (That particular pineapple has since been harvested and eaten!) The stage that was omitted from that previous series was the earliest one: the pineapple flower. Here is a new pineapple flower that is blooming in our garden now. The beginning of what will be the pineapple's crown is just starting to form in the center of the flower. I took this photo a few days ago, immediately after a rain. Look carefully and you will see that the pineapple has captured some rainwater in the crown. Wow - how colorful! 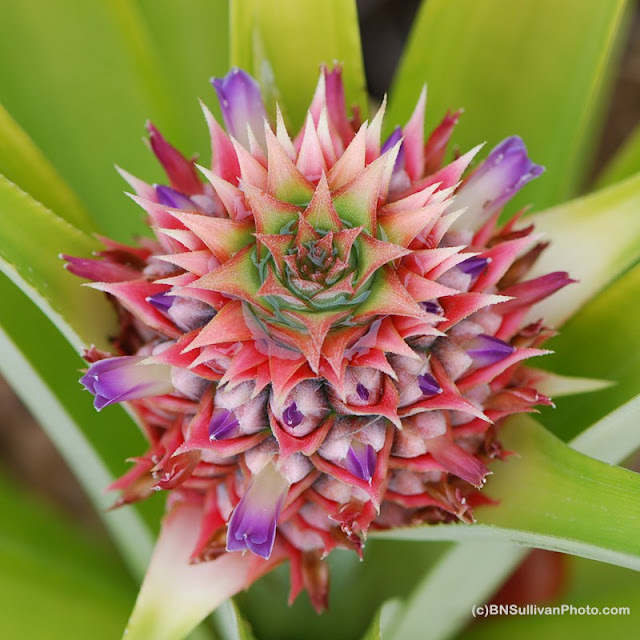 What happens to the flower as the pineapple begins to grow? Does the pineapple grow on top of it or from the bottom or out of the middle? With the crown at the top of the flower (which seems pretty tall) it seems like it would emerge form the center. I never pictured them to look like that - how beautiful they are! Bet that pineapple was delicious! It's so amazing how the pineapple forms. I've been following it's progress. These colors of the flower are spectacular! @ Kathy - The fruit forms at first right inside the flower, then grows upward, with the crown on top. And yes, that pineapple was yummy -- ripened on the plant to perfection. @ Becky -- I love the colors, too. I think most people would not expect to see purple flowers on a pineapple plant. The pineapple looks really nice & colourful ! I am catching up with your blog posts, have been slow in following & catching up with fellow photography blogs ! Looking foward when the pineapple fruit is fully grown and ripe ! @ Tink - Thanks for dropping by. @ Jinghui - Nice to 'see' you again. I have been busy, too, and unable to visit everyone's blogs as often as I used to. I need to catch up, too. This is a lovely shot. I've never seen a pineapple flower. The colors are so pretty.